Miller & Zois is one of the leading personal injury law firms in the Mid-Atlantic region and Pennsylvania is one of our core home jurisdictions. Despite recent legislative tort reform efforts, Pennsylvania continues to be a very good jurisdiction for personal injury plaintiffs. In fact, Philadelphia County is widely considered to be one of the most plaintiff-friendly venues in the entire country. Philly consistently ranks in the top 5 on the Judicial Hellholes list which the American Tort Reform Association (ATRA) uses to rank the most favorable court venues for tort plaintiffs. Pennsylvania Court System Pennsylvania has a 4-tiered judicial system with the Pa. Supreme Court at the top of the pyramid. 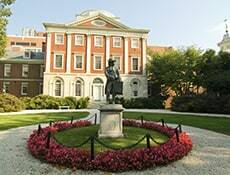 Each County has a Court of Common Pleas which is where all civil tort cases are handled. Pennsylvania Tort Laws Personal injury cases in Pennsylvania are governed by state tort law, a complex mix of common law, statutory code and state and local regulations. Pennsylvania Car Accident Claims Pennsylvania has some of the most dangerous roadways in the country. Learn about Pa. auto accident statistics; accident & insurance laws; and the average value of auto tort injury cases. Pennsylvania Medical Malpractice Despite being home to some of the world’s top hospitals, medical negligence occurs every day in across the state of Pennsylvania. Learn about Pa. medical malpractice laws and claims. Pennsylvania Birth Injury Cases Every year thousands of babies born in hospitals across Pennsylvania are diagnosed with cerebral palsy as a result of oxygen deprivation during pregnancy or childbirth. 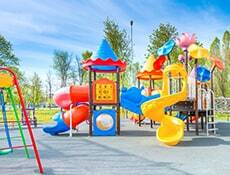 Learn about cerebral palsy birth injury lawsuits in Pa.
Other Pennsylvania Injury Cases The lawyers at Miller & Zois have track record of success with all types of Pennsylvania tort cases including slip and falls, product liability and dangerous drug cases. Pennsylvania’s judicial is organized into a complex, multi-tiered pyramid with 2 levels of general jurisdiction courts and 2 levels of appellate courts. 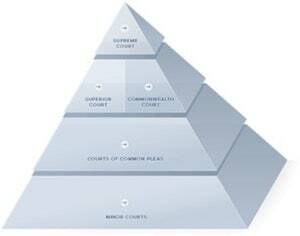 At the bottom level of Pennsylvania’s judicial pyramid are the local municipal courts. These small local courts have elected magistrates and handle minor things like traffic violations and preliminary criminal and bail review hearings. The next level up is the real workhorse of the Pa. judiciary: the Court of Common Pleas. Each County in the state has its own Court of Common Pleas which has general jurisdiction over all civil tort cases within the County. This is where personal injury lawsuits for everything from medical malpractice to dog bites are handled. The next highest level in the Pa. court system is a bifurcated appellate tier comprised of the Superior Court and the Commonwealth Court. The Superior Court is basically an intermediate appellate court. Appeals from any civil or criminal case are initially decided by the Superior Court. The Commonwealth Court has special jurisdiction over all civil suits filed against the Commonwealth of Pennsylvania. It also hears administrative appeals from decisions by state agencies or local governments. At the very top of Pennsylvania’s unified judicial system is the Pennsylvania Supreme Court which is the highest appellate court in the state. The Pa. Supreme Court has 7 judges appointed by the governor and it functions much like the U.S. Supreme Court. The Supreme Court hears discretionary appeals from all lower court cases. It also exercises administrative control over the entire judicial system. In Pennsylvania the statute of limitations for all personal injury claims (including medical malpractice and product liability) is 2 years from when the causes of action accrues. 42 Pa. Consol. Stat. § 5524(2). 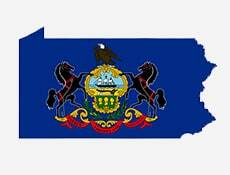 Pennsylvania like many other states has adopted the "discovery rule" for calculating the 2 year time limit. Under this rule, the statute of limitations does not actually start running until the injured party knows or by reasonable diligence should have known of the injury or the cause of the injury. Pennsylvania also has an exception to the 2-year limitation period for claims by minors. Minors under the age of 18 can wait to file their suit until 2 years after they turn 18. So if a 12 year is injured in an accident they will have until they are 20 to file a claim. Regardless of the time of the injury, the statute of limitation will not start running until the minor has turned 18. 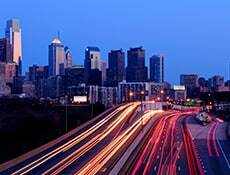 Pennsylvania has adopted a modified comparative negligence rule where an individual's own negligence generally will not bar him from recovering damages. Instead, fault percentages are allocated and each party will be responsible for their own percentage of damages, as long as the party's percentage of fault is not greater than the party against whom the lawsuit is being filed. 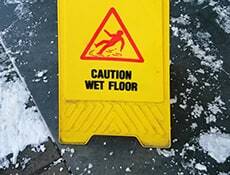 However, if the claimant is 51% or more responsible for the injury than he cannot recover any damages. For example, let's say a plaintiff is found to be 30% at fault for the accident and the jury awards total damages of $100,000. The plaintiff will only get $70,000 because the damages are reduced by his 30% share of fault. However, if that same plaintiff is found to be 51% at fault for the accident he will not get anything in Pennsylvania. In cases where there are multiple defendants involved, as long as the claimant's negligence is not greater than the combined negligence of all the defendants, the claimant is not barred for recovery. Pa. allows three different types of damages in injury cases: economic, non-economic, and punitive damages. Economic damages are damages that are awarded based on direct result of actual financial loss. This can include future and past medical bills, lost incomes, property damage, loss of earning capacity, and loss of value. Non-economic damages are qualitative damages that are subjectively determined by the jury. This can include pain, emotional anguish, humiliation, reputational damage, loss of enjoyment of life/activities, etc. Punitive damages are damages awarded to punish the harmful behavior of the defendant. This is usually awarded when the defendant's action is malicious, willful, or wanton. Pennsylvania does not have any limits on economic or non-economic damages. Article III. Sec 18 of Pennsylvania's Constitution prohibits limiting damages for personal injuries or death. However, in medical malpractice cases, all punitive damages are capped at 2 times the amount awarded for non-economic and economic damages. Almost all personal injury tort cases for things like medical malpractice, auto accidents, or product liability, initially get filed in the Court of Common Pleas for the applicable County. Each Court of Common Pleas has its own administrative and procedural rules and policies for how civil cases are assigned, processed and docketed for trial. Pennsylvania is geographically the largest state on the East Coast. The state boundaries encompass a very diverse range of demographics from modern urban cities like Philadelphia to rural Amish farmland in Lancaster. 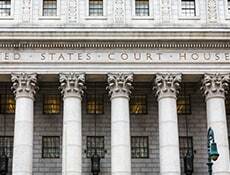 As a result of these geographic differences the administration of civil cases in the Courts of Common Pleas tends to vary significantly depending on where you are. The Court of Common Pleas for Philadelphia County is one of the busiest state courts in the entire country. Literally thousands of injury cases are efficiently processed in Philadelphia County every year and the court has earned a good reputation for speed, legal expertise and fairness. If you have Pennsylvania tort claim for medical malpractice, birth injury, an auto accident, product liability or anything else contact the Pennsylvania personal injury lawyers at Miller & Zois now for a free consultation. Call us at 800-553-8082 or get an online consultation.